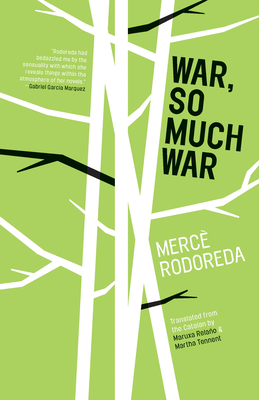 Featured on Jeff VanderMeer's "Epic List of Favorite Books Read in 2015"
Despite its title, there is little of war and much of the fantastic in this coming-of-age story, which was the last novel Merc Rodoreda published during her lifetime. We first meet its young protagonist, Adri Guinart, as he is leaving Barcelona out of boredom and a thirst for freedom, embarking on a long journey through the backwaters of a rural land that one can only suppose is Catalonia, accompanied by the interminable, distant rumblings of an indefinable war. In vignette-like chapters and with a narrative style imbued with the fantastic, Guinart meets with numerous adventures and peculiar characters who offer him a composite, if surrealistic, view of an impoverished, war-ravaged society and shape his perception of his place in the world. As in Rodoreda's Death in Spring, nature and death play an fundamental role in a narrative that often takes on a phantasmagoric quality and seems to be a meditation on the consequences of moral degradation and the inescapable presence of evil. Merc Rodoreda (1908-1983) is widely regarded as the most important Catalan writer of the twentieth century. Exiled in France and Switzerland following the Spanish Civil War, Rodoreda began writing the novels and short stories--Twenty-Two Short Stories, The Time of the Doves, Camellia Street, Garden by the Sea--that would eventually make her internationally famous. Maruxa Rela o is a journalist and translator based in Barcelona. She has worked as a translator for The Wall Street Journal, a writer for NY1, and wrote articles for the New York Daily News, Newsday, and New York magazine, among other publications. Martha Tennent was born in the U.S, but has lived most of her life in Barcelona where she served as founding dean of the School of Translation and Interpreting at the University of Vic. She translates from Spanish and Catalan, and received an NEA Translation Fellowship for her work on Rodoreda.